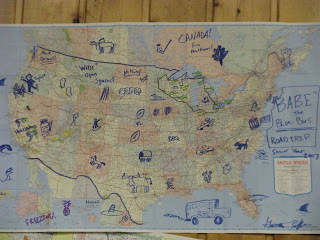 I saw this map of the United States on the lodge wall at family camp a few weeks back -- the theme for the summer is road trip -- and I almost fell over laughing. Check it out. (Click on it for a bigger image.) You'll notice all kinds of regional icons. Longhorns in Texas. A guitar in Tennessee. A snowboarder in Colorado. Nothing in North Dakota. And in Seattle? Mark Driscoll. With a double underline and an exclamation mark. That's quite a statement for a 30-something father of five. No longer just an author, speaker and founding pastor of Mars Hill Church. Now he's a cultural landmark. Darn it if I can't find a reason to argue. Driscoll is one of the brightest minds in the evangelical world, and if his words are to be believed, he flat-out loves Jesus and the Bible. It infuses his writing, his preaching and his life. Which is why his new book, "Religion Saves + Nine Other Misconceptions" is a book you have to read. The idea for the book was born a few years back when Driscoll was preaching through 1 Corinthians. He was struck by the fact that the letter was a series of answers to various questions asked by the Corinthian church. He wondered what questions his own generation would pose, if given the chance. So he opened up the Mars Hill website, and 893 questions later, he had the makings of a controversial yet incredibly relevant sermon series. I pretty much inhaled this book. To say that I enjoyed it would be an understatement. It energized me and made me think and put fresh fire in my soul. (It also made it really hard to fall asleep at night, since my mind was whirring with new thoughts.) Driscoll's style is edgy, and I suppose that isn't for everyone. But for me, a straight answer -- even if its harsh -- is incredibly refreshing. But the best part is I learned something with every turn of the page. Driscoll demands that you love God with all your mind, and his writing doesn't dumb down deep theological ideas. For example, his chapter on grace outlines 13 experiences of God's grace in our lives. When he tackles weighty topics like predestination, he presents the different viewpoints -- in this case, Calvinism and Arminianism -- explaining their historical and philosophical underpinnings, before he builds his case for his own answer to the question. And he does it all with Bible verse after Bible verse. Driscoll never just "gives his opinion." He gives what he sees in God's Word, and his every point is footnoted and annotated with Scripture. Ready to dive in for yourself? You can get "Religion Saves" at Amazon or your local Christian bookstore. I thought about giving away my copy -- but I intend to keep this one on my bookshelf for years to come. It's too intelligent, too Bible-based, too authentic to only read once. I have a feeling it will be one of my maps for the road trip we called life. For other viewpoints on "Religion Saves," check out the blog tour. Thanks for sharing about this book! I was lucky enough to get to hear Mark speak at a marriage conference last fall and I instantly loved his honest approach to the Word. I will definitely be adding this to my reading list! Alright, you pushed me over the edge. It's been on our list of books to get, I can wait no longer now! I really, really appreciated this review. Good stuff to know before I dig into it! Can't wait. I've read quite a few things lately about Mark Driscoll and this book and I am intrigued. Thanks for the review. Thanks for the information. I've got to get the book now. Darn! I was hoping you were giving away a copy and that I'd win. I'm totally intrigued. Driscoll and I have mutual friends but I've never heard the man speak. I will look for this book. Thanks for sharing about the book. I love hearing what people think about different resources. When I attended Mars Hill I would just drink in the hour long messages and never notice the time. I left for a few reasons but a straight shooter he is! Looks like an interesting read! Doesn't that have to do with laxatives? !